Bing Rewards Reviews - Legit or Scam? Bing Rewards Reviews – Legit or Scam? Online rewards websites were created as a way for marketers and search engine providers to get access for information. You agree to let them record the types of searches you complete and the websites you click on, and they will compensate you with money or prizes. Customers who are interested in becoming Bing Rewards members can do so completely for free, and get started with their system to see whether or not it is something they may be interested in continuing. 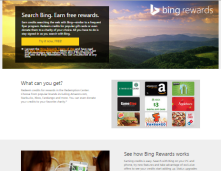 The Bing Rewards website describes their program as being similar to a frequent flyer program. As long as you sign in to your Bing account and remain signed in, each time you search you will receive points from Bing. It has been reported that Bing Rewards gives you points for every two searches you complete, and while the most points you can typically earn in a day is ten, these are just the points you can from searches. Microsoft generally provides its users with a way to earn bonus points from clicking on a specific service or a website that is promoting. Once you have accumulated a certain number of points, you can go to their Redemption Center and pick a gift card from your chosen retailer, including Amazon.com, Starbucks, Game Stop, Groupon, Fandango, and more. How Does Bing Rewards Compare? There are many, many independently operating rewards programs out there, including Swagbucks and Qmee, which partner with different companies to provide them with the data they receive from their users. Generally speaking, using an independent reward program requires you to download a special tool bar or other specific tool to your computer to ensure the company can collect your data. Companies like Bing and Google’s Screenwise Trends Panel can easily record your search information with no extra work on your part, because these are generally the search engines people are using anyway. But, unlike other browser rewards programs, including the one offered by Google, Bing does want you to search either through your computer or your phone at least once a day, in order to stay active with their program. Thankfully this should not be difficult for most smartphone or mobile device owners, nor those who work with a computer every day. Average Rating for " Bing Rewards Reviews " is 2.27 out of 5 based on 30 reviews. The best part of Bing rewards is that you don't need to spend more than 5 minutes per day to reach the minimum payout. Even though you can't make more than $10 per month, you can get that small amount every month without fail. If you are using Microsoft products like Xbox, then you can easily redeem the points. I think it also offers up to 10% discount on all Microsoft products and services. For business, I do research online. I thought Microsoft rewards would be a good way to earn business related materials or prizes while working. It has been a nightmare. My points have vanished from my account by the thousands. Some points didn't add on at all, often you can't reach Microsoft for days on end. After three phone calls and about 12 emails, they insisted I somehow catch the problem, give them a recording of the actual problem(s) occurring and give them diagnostics of each of my new computers. As I said, my computers are new. I knew they couldn't be the problem. Also, I felt diagnostics and recordings violated my privacy. So, I asked what would happen to the information I provided. Microsoft refused to tell me their evaluation process or what they use the info for. It took several emails before they promised to only use the information to help me with my claim. On a video recording, I caught the points disappearing and not adding up. After I documented the troubles occurring, through their chosen method, Microsoft refused to admit there was a problem!! They gave me a tiny percentage of the thousands of points they owed me, saying they only did this as a courtesy??!! So, I did an internet search. It seems their system is plagued by disappearing points and other troubles. Worse yet, Microsoft knows there's a problem but refuses to acknowledge it. To me, this means you're running a scam on unsuspecting and hopeful people. Everyone affected by this should contact the Better Business Bureau and refuse to do business with Microsoft. We should blitz social media with information on this scam. Other people need to know before they invest their time and effort. I finally had gotten enough points for a 5$ amazon gift card. This was my first time redeeming anything from Bing, so I was excited. The moment I go to redeem my reward, I check back to find out it's been declined without any explanation. I tried contacting customer support, but I always get "Unfortunately, we are unable to process your request at this time. We apologize for the inconvenience. Please try again later." My points were never refunded to me either. Will not be using ever again. I've been with Bing/Microsoft for over a year. Honestly, I love it. I would be using the same search engine to look up things online. Why not get points for it? They have fun quizzes every Tuesday with interesting topics. I don't see why someone wouldn't sign up. It's a win-win. Thank Bing/Microsoft. The bing rewards worked well for me, but recently they changed it to microsoft rewards, and my points are just not increasing at all. I used bing for search and my points were at constant 5957 for two days. Then it finally changed and started going up and then down randomly. For a day I should get 260 points ( 100 for Mobile search, 250 for PC search and 10 extra points) However, I got only 150 points in total after completing the search. I rated 5 stars... Because so far I do not have a problem. I've been on Bing Rewards for 2 months and did not have a problem. I redeemed like 10 dollars worth of Xbox Gift cards got them in a day, even in the same day! I just hope it stays that way. I liked the Bing Rewards, I was able to earn 3 gift cards for Amazon, and yes, I did receive them. I have transferred them to my Amazon account. So it is legitimate. But, I really don't like it now that it has changed to Microsoft Rewards. I have less opportunities to earn points and now gift cards cost more points. I'm still going to use it, but once I hit my max daily searches I switch to another program I use to do searches and earn points. they scam they waste my time and they lie and take away point no reason stay away they waste your time and effort. I collected enough points for a gift card and never received it. Not impressed at all. Just put $20 into my Starbucks account from Bing rewards. Happy about that.